Nightmare Explosive Conflict EC Operation guide for Zorn and Toth with detailed strategy and video. Zorn and Toth is the first boss in Nightmare EC and doesn’t have a lot of additional mechanics compared to EC Hardmode. A medpack and good situaitonal awareness is required for this fight. Put in place to remove medpack use from this fight. As soon as you engage T &Z, everyone in the raid will receive an uncurable DoT called Baradium Poisoning that can be only removed by using a medpack (any size will do, buy them from the repair droid if you don’t have a reuseable one). Of course if you use a good medpack it will recover more of the health you lost and put less stress on your healers. Baradium Poisoning at deals 2.2 –2.8k damage every second until removed and will kill someone if they don’t react fast enough. Tip: Watch for the icon on your debuff bar and use your medpack as soon as you see it. 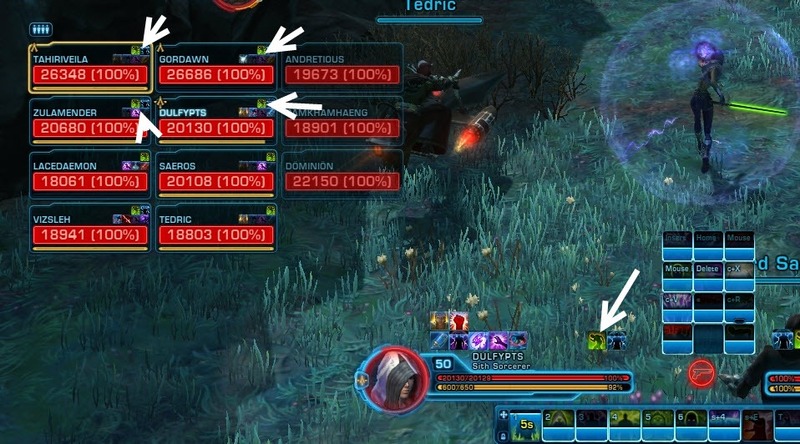 Sorcs/Sage should bubble everyone before the fight and if everyone is quick to use their medpack, the raid will not take any damage as the sorc/sage shield will absorb most of the damage. In hardmode, you could probably get away with DPSing just a bit more when the red circles land below you and then move out of it. This is no longer the case in Nightmare mode. 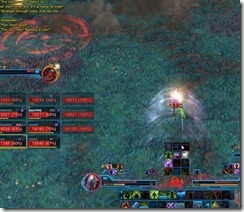 There is very little reaction time between the red circle and the spikes from the ground (12-17k damage). It is best to just keeping during this phase and don’t run into other players (incase you run into a red circle dropped on them). Tip: Have Zorn on focus target with castbars enabled. Red circles will begin 6-7 seconds into the channeled Sonic Paralysis and ends when Sonic Paralysis has finished channeling. This way, you can stop running around the second the phase is over to help meet the enrage timer. Toth’s Smash now has a knockback component as opposed to just raw damage. This isn’t really a big deal as melees tend to be on Toth’s side and they can just use their gap closers (i.e. force leap) to get back in. This can be a bit annoying for the healers but they can put their backs on the wall (just make sure you don’t eat the cleave from Toth when you do that). Toth also receives a buff called Nightmare Berserk during the Berserk phase that reduces the damage he takes by 50%. This should balance out the increased HP that Zorn receives but you will still want to make sure to even out your DPS between the two and kill them roughly at the same time (Toth first, and then Zorn). Handler Murdok is still fairly easy. The only differences is that he now can’t be interrupted (has the immunity to interrupt buff) so make sure you get out of the red circles and face him away from the raid so that his conal doesn’t hurt the rest of the raid. Pretty much everything you did in hardmode still applies in Nightmare. Use the same strat/positioning you used in hardmode should work fine here. This section is used as a refresher on the hardmode EC mechanics if you are unsure. At 90, 70, 50, 30, 10%, Toth leaps to Zorn. Anyone within 30m of Zorn will get hit by Fearful (take double damage from Zorn’s abilities and take 6k reflected damage if they attempt to DPS Zorn). . For this reason, we always have ranged dps stay at max range to Zorn and melee DPS on Toth. If a healer or DPS on Zorn receives Fearful, they can switch to Toth’s side. Tank swap here is required. At 80, 40%, Toth goes Berserk while Zorn starts Baradium Toss at anyone within 25m. The Baradium Toss hits about 6.4k unless you have the Fearful debuff (you shouldn’t be on Zorn’s side if you have that debuff). The healer can usually take the Baradium Toss hits (hits twice). Zorn will move if there are no players within 25m of him to receive the Baradium Toss.One player will also receive a yellow circle under their feet and they will need to run to Toth to receive Baradium Heave that clears Toth out of the Berserk phase. At 60%, 20%, Zorn will cast Sonic Paralysis (20s channel) on the tank (remember that it is a buff so the tank receiving it can just click it off). A few seconds into that channel, red circles will appear on the ground and anyone not moving out of it will get hit by Ground Shatter. At 5%, Toth will start doing double damage Ground Shatter nonstop and Zorn will throw rocks. Kill Toth first and then Zorn. If Zorn is enraged at this point, watch out for his 25m shriek. Zorn casts Shriek that applies Mental Anguish on the tank (sometimes the healer will receive it as well if they are within 25m). Cleanse it ASAP (tank first, and then healer). Melee DPS always on Toth, ranged DPS always on Zorn (max range). This will allow the DPS to avoid Fearful. When T leaps to Z, you can have a melee DPS with a taunt to separate them if the tanks can’t separate them fast enough. I know this isn’t entirely related but are the servers still down 2 hours past due? lol at the guy raging at you by whisper near the end there. Something else we noticed last night in our kill… when berserked, Toth takes 50% less damage… that’s probably why they bumped up Zorns health, to account for the DPS difference during the Berserk phases. If you watch Toth’s buffs, he’s got a new one called ‘Nightmare Berserk’ that accounts for this DR.
Oh, and the other big thing we noticed was that the handler guy who jumps down after the 2 doruks are dead can no longer be interrupted, so you have to run out of AOE reticules and just heal through his crap. Here is a better version of the video I posted before.